It takes some effort to ensure furniture fits into a space well. By following the steps outlined below you will be closer to attaining spaces that appear inviting, comfortable, that facilitate conversation and that flatter your best pieces. 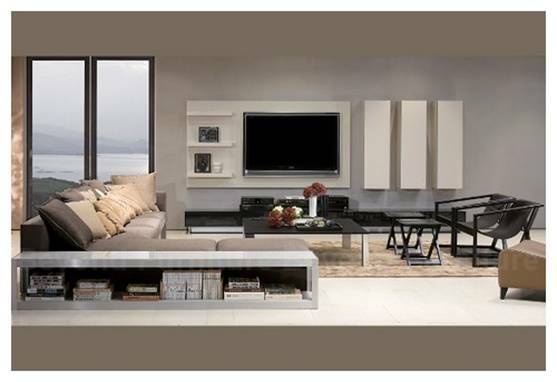 Furniture can be arranged in a “pod” manner where pieces are grouped together according to their usage. One area might be for dining, another for study, and another for watching TV. It can also be arranged in a communal way where furniture is focussed on one area or feature in the room, and pieces are placed either symmetrically or radially around it. With radial arrangement pieces are placed around focal point. In a very large room, smaller communal arrangements may work within the overall “pod” arrangement. Find the focal point for the furniture. 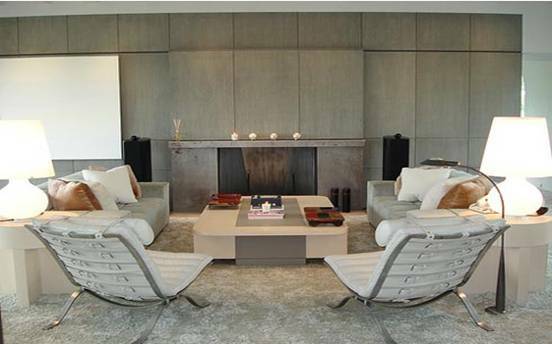 This might be a fireplace, TV screen, window, featured coffee table, credenza, or entertainment unit. In a large room, there may be more than one focal point such as a fireplace, as well as a credenza and dining room table. If the focal point is architectural, think about how you can echo shape in the furniture, e.g. a curved sofa or half-round table in a bay window, or square edged furniture symmetrically placed against a geometric brick fireplace. If the focal point is on or near a wall, think about an imaginary line or “axis” drawn through the centre of this focal point. Your furniture will look good when positioned on or either side of this line. When lining up furniture against a credenza or bookshelf, the best axis is at the midpoint. First divide your furniture up in primary and secondary items. Primary items will be the largest e.g. dining room table, credenza or bed. Secondary items are side tables, coffee tables, shelves, lamps. Place your primary pieces, making sure there is some space around them so you can see their shape in relation to the shape of the room. Once the primary pieces are positioned, place the secondary pieces around them. Wherever possible keep pieces of similar scale together. A small light-weight side table works best next to a small chair, rather than a large heavy sofa. Consider also the practicality of your furniture placement. Position chairs around a coffee table so that they are close enough for conversation and for placing drinks. Every piece of furniture has visual weight from its size, shape, colour and texture, and sometimes the distance from the above axis. The bigger the piece, the darker the colour, the stronger the pattern; the heavier its visual weight. Strong sunlight can change the weight or colour intensity of furniture. Bright pieces may seem garish when lit by strong light from a window. A beautiful but dark piece might disappear in a dimly light corner. For symmetrical arrangement, you “balance’ the weight of pieces on either side of an imagined line. Large pieces of bland colour and therefore moderate visual weight can be balanced by small pieces with strong colour with a lot of air around them. Also, try to position pieces of furniture opposite one another e.g. two chairs opposite a sofa, or a table opposite a credenza. 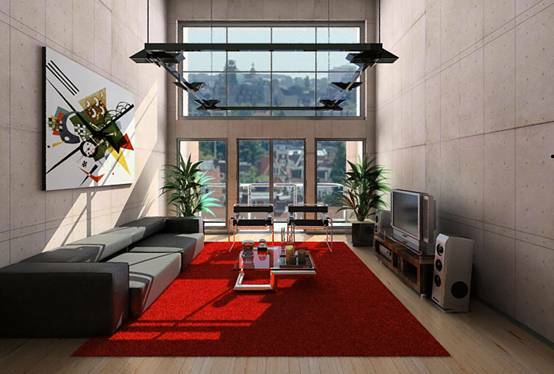 Arrange the furniture for traffic and secondary activities. If possible, create enough space between your furniture and the walls so that traffic goes around a setting, not through it. Think about the shape and the lines you create with your furniture. As in all decorating, try to reduce the number of vertical edges or leading lines. For example, if chairs are of different sizes, keep the leading edge as one straight line. While reducing leading vertical lines will make your furniture arrangement look more connected, and therefore feel “right”, its good increase horizontal lines. Consider the height of your furniture and where possible break up the horizontal lines by positioning pieces of different heights together. The exception is when hanging pictures where it’s best to keep the top edge as one line. These tips will help you create a room whose arrangement feels “right”. They are a guide, a starting point. Every room is different and there will always be exceptions to the above recommendations. The point is that you look at the room and consider these things, and then do what you think works for you, and the space you are furnishing. Storage ideas. Are you running our of room in your home? Then read this article for ideas on where to put all your stuff.